Case 01: Armenian Genocide with german weapons - rib-stardusts Webseite! Chapter 4: Who profited from the genocide? Chapter 5: What became of those who directed the genocide, and their accomplices? Chapter 6: Are there parallels to present-day wars and genocidal actions? In the years 1895 to 1916, Turkey’s state security forces committed many-thousand-fold mass murders of Armenians in what was then the Ottoman Empire. The great majority of the members of the Bundestag were probably not aware that the genocide of the Armenians was perpetrated largely with German weapons of war. “From an Armenian physician, Kafafian, we learned the following: two young women teachers, who had been trained at the American College in Harput, were passing through the Kemah Canyon on June 10th, together with the other expellees. They came under crossfire from the Kurds in front and the gendarmery behind ... The two young women threw themselves onto the ground, and played dead, and they succeeded in fleeing and returning to Erzincan, where they asked for help in the Red Cross Hospital via the Armenian physician. On June 11th regular troops were then sent out, supposedly to punish the Kurds. But instead they -- the troops -- slaughtered the entire defenseless group that remained. From the mouths of Turkish soldiers who were present themselves we heard how the women begged for mercy, and how some of them threw their children into the river themselves. Thousands and thousands of civilians fell victim to such conflicts. In the end, about a million Armenians died in the systematic deportations by force of arms into the emptiness of the Syrian desert, where they perished of hunger and thirst, if they had not already died of exhaustion on the way there or been massacred by gangs of robbers. This was government-ordered mass murder, committed by Turkish security forces with the knowledge and consent of the highest government circles in Germany. German officers served in Turkish general staffs and commanded Turkish regiments, divisions, and armies, that were equipped mainly with long rifles and carbines from the German arms-maker Mauser. How did it come about that German weapons and soldiers were decisive participants in the genocide in the Armenian-populated areas of the Ottoman Empire? Until 1917, Emperor Wilhelm II was linked by decades of close friendship and brotherhood in arms to the Turkish Sultan Abdülhamid II and his successor, Mehmet V. The Ottoman Empire was in a phase of weakness in the last quarter of the nineteenth century. It was considered the “sick man on the Bosporus” at the courts of Berlin, Moscow, London and Vienna. Russia in particular tried to expand its sphere of influence by conquering areas in the Ottoman Empire, such as the Dardanelles, which would have given the Czar access to the Mediterranean. The Russian-Turkish War of 1876-77, in which the Bulgarians won their independence, ended in a defeat for the Ottoman Empire and its enfeebled army. 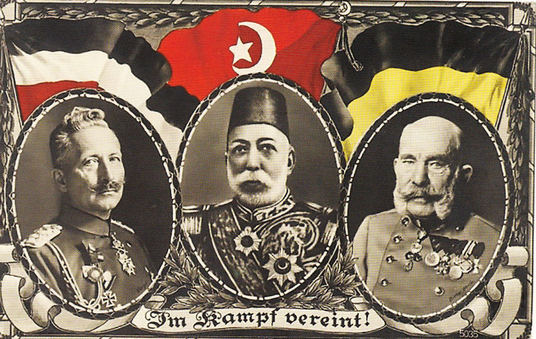 Emperor Wilhelm II, Sultan Mehmed V, and Emperor Franz Joseph I. In order to regain its previous strength, the sultan needed military instructors and modern weapons from Europe. The German emperor, for his part, dreamed of a railway line through Anatolia and of access to raw materials and markets for German goods in Asia Minor as far as Persia. Thus the Germans and Ottomans saw themselves as having common strategic interests. The Prussian Major-General Colmar, Baron von der Goltz already became a military adviser to the Ottoman court in 1883, commissioned to modernize the military training schools in the empire. He was predestined for this task by his many years' work as a military trainer in the Prussian army. Due to his relevant writings on military theory (such as Das Volk in Waffen), he was considered an advocate of total war and a specialist in combating insurrections. Against much resistance, but under the protection of the highest authority, the sultan, he instituted many Prussian-oriented reforms in the Ottoman Army. "Goltz involved himself actively in the policies of the Ottoman army, he wrote memoranda for the Sultan, he wanted to actually change things -- and he succeeded... This prestige that he enjoyed both within the Ottoman officer corps and on the part of the ruler, Goltz soon used to broker large arms deals between German arms manufacturers and the Ottomans. Goltz became an unofficial sales representative, as it were, of the Krupp firm, for whom he arranged sales of artillery worth more than 70 million gold marks during his time in Constantinople. With the help of Goltz, the German rifle manufacturer Mauser succeeded in cracking the previous domestic monopoly on supply, and becoming the main outfitter of the Ottoman army themselves. Supported by his good offices, and after firing trials in Turkey, the company from Oberndorf am Neckar prevailed over competitors from Austria (Mannlicher), France (Hotchkiss), and Britain (Martini-Henry). Paul Mauser, later raised to the peerage by the King of Württemberg, was able to present his latest developments to the Sultan in person. In February 1887, the Ministry of War of the Ottoman Empire and a consortium of German companies, consisting of the firms of Mauser and Ludwig Loewe & Co KG, signed a contract for the supply of 500,000 model M/87 long rifles and 50,000 carbines of the same model. In order to handle this huge order without hindering one another, the two German firms did a deal: Mauser was to be sold to Loewe, and in return, the entire production would be done in Oberndorf. The brothers Paul and Wilhelm Mauser, the proprietors of the firm since 1874, retained about 7% of the share capital. The order had to be completed within four years. In the course of the production process, several modifications of the M/87 rifle were made: first the M/89 and finally the M/90, a repeating rifle with a mid-stock magazine for 7.65-mm caliber nitro-powder cartridges. Of this model, short-barreled carbine versions were manufactured specially for the cavalry, that were particularly suitable for mounted pursuit of fleeing people. The first mass murders had already taken place in 1893 in certain Armenian-inhabited areas. In the Sasun area, there was a punitive expedition by the security forces against Armenians who had resisted tax collectors. The second phase of the massacres began in October 1895 with Armenian riots in Constantinople, as a result of which the Sultan made promises of reforms to the Armenians. These triggered campaigns of murder in various regions of Anatolia. In November 1895, there was a siege by Ottoman troops in Zeitun (Turkish: Süleimaniye), which was only halted by the intervention of European diplomats. Finally, there were the riots in Van in mid-June 1896. According to the reports of the foreign press, the massacres there were initiated and performed by the Ottoman authorities. However, a government-conducted execution of the massacres was only partial and unsystematic. Kurds and part of the other Moslem population were the main performers of the mass murders. The massacres, which cost the lives of about a hundred thousand people, aroused a wave of indignation in Europe. But the reactions of the European governments were limited to ineffective protests. It is important to note that, although there were already tensions between Moslems and Armenians before 1893, with assaults and occasional murders, which were reported in the European press, in 1893, with the approval of the German government, the last of the 500,000 Mauser long rifles and carbines of the first order were delivered from Oberndorf to Turkey. There are no reliable sources to tell us whether Turkish security forces, equipped with just those rifles, already participated in massacres and shootings at that time. Since the rifles for Turkey were delivered between 1890 and 1893, when the first massacres with the participation of Ottoman army units had already occurred, it may be assumed that the Turkish soldiers and gendarmes who took part in such murders were equipped at least in part with rifles from Oberndorf. However, the distribution of the Mauser rifles from the last shipment was not rapid enough for General von der Goltz. “Goltz blamed the Sultan for them still not having been issued to the troops in September 1895, whom he said lacked the real will to equip his soldiers properly for counter-insurgency,” according to the historian Carl Alexander Krethlow. Aiding and abetting genocide of Christians from Christian charity? This quotation, of matchless hypocrisy and hubris, proves that Wilhelm II had not the slightest intention of halting the Turkish butcher of the Armenians and his vassals, not even when, seventeen years later, the campaigns of murder intensified to a genocide the likes of which the world had not seen before. Erected as a residence for the acceptance commissions of the Ottoman Empire in 1888. The building was demolished in 1961 because it had been hit by a bomb in the Second World War. In the meantime, the people in Oberndorf were basking in the favor of Abdülhamid II. The patriarch of the firm, Paul von Mauser, who had been raised to the peerage by the King of Württemberg, reported about an extremely friendly atmosphere at the Sultan’s court, upon returning from one of his last visits to Constantinople. He had signed contracts for further deliveries of rifles, amounting to hundreds of thousands, there. In return, the Turkish officers of the various commissions of acceptance were treated extremely obligingly in Oberndorf. 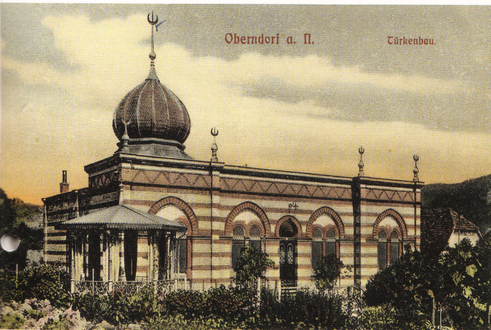 Some members of the various Turkish commissions of acceptance in Oberndorf later rose to prominence in the military and government of the Ottoman Empire, making them accomplices or accessories after the fact in the genocide, such as Mahmud Sevket Paşa, who rose first to Marshal, then Grand Vizier, Foreign Minister, and Minister of War, and became the leading figure of the Young Turk movement. This movement sent Sultan Abdülhamid into exile in 1909, and intensified the pogroms against the Armenians. 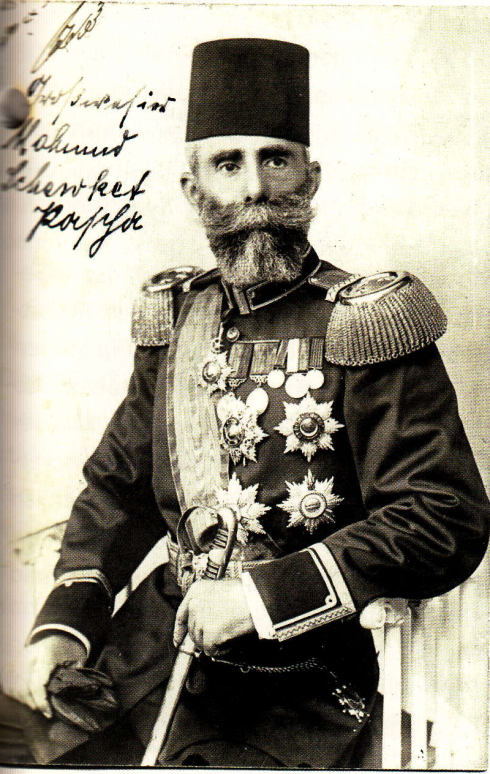 In 1913 Sevket, whose successor as Grand Vizier, Ahmed Izzet Paşa, had also belonged to the Oberndorf commission of acceptance, was shot dead by an assassin. The world stood at the brink of the First World War. The Ottoman Empire was heavily armed for it: almost a million long rifles, carbines, machine guns and pistols from Oberndorf, as well as thousands of field-pieces from Krupp, formed the backbone of its armament. But the Turks were still hesitating to enter the war on Germany’s side. The First World War started in the eastern European theater in late October 1914, with an attack by the German-Turkish fleet on Russia in the Black Sea. The fleet was commanded by the German Admiral Wilhelm Souchon. Now there was no holding back for the Turks, either. 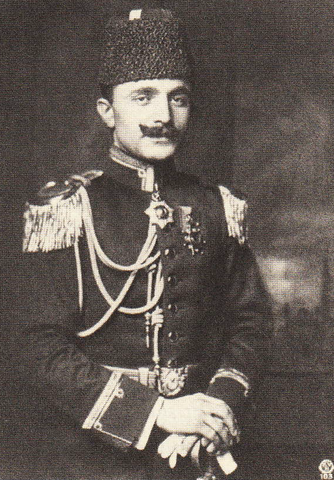 The commander-in-chief of the Ottoman armed forces, Enver Paşa, had suggested three strategic directions for the war in the Near East to the German-Austrian entente: an attack on Odessa, on Egypt, and a drive against Russia in the Caucasus. As a first step, they planned to drive the Russians back out of the Armenian regions in the Caucasus, and reconquer those regions that had formerly belonged to the Ottoman Empire. But the winter campaign turned into a disaster. The Third Army, in charge of the eastern front, was insufficiently equipped for this—there were neither suitable means of transportation, nor winter clothing, nor sufficient food for the Turks fighting in deep snow. A large part of them froze or starved to death, or died of diseases. Of the roughly one hundred thousand men of the Third Army, only about ten thousand survived. Only a small portion had fallen in battle against the Russians, who sheltered behind their fortified positions on the Sarikamis plateau. When the news of the utter defeat spread in January 1915, the Turkish officers and their German commander, General Bronsart von Schellendorf, needed a scapegoat urgently. A legend was cooked up: Enver Paşa said originally that all the troops, and thus also the Armenians in the ranks of the Ottoman army, had fought bravely; but soon it was being pointed out more and more often that many Armenians were active on the Russian side, including many Armenians who had switched from the Turkish to the Russian side, it was said. But more important was the psychological effect in the general staff, and the stab-in-the-back tale that resulted. In order to exonerate themselves, Enver, Bronsart and company soon claimed that the reason for the defeat had been the hostile Armenian population behind the front. This tale was presented again and again until the end of the First World War as justification for the expulsion of the Armenians from the areas in Anatolia where they lived, and their murder, and as the reason why the German officers in the general staffs of the Turkish army did not make every effort to halt the murderers when the genocide of the Armenians began. As in almost all genocidal mass-murders[TS1] of the twentieth century, the murders were not particularly interested in being photographed while killing people. There are almost no films documenting the massacres of the Armenians. And the photos that exist usually show piles of corpses after the shootings, or victims of hanging. So it is difficult to classify the victims by the way in which they were killed. Many were driven into groups and shot, others beaten to death with clubs, beheaded with sabers, or taken out to sea and thrown overboard. It is important to note that regular Turkish soldiers and gendarmes—and sometimes their German comrades-in-arms—were involved in almost all the actions of the systematic genocide by expulsion, shooting, hanging, drowning, and starving that started in 1915. Most of them were armed with Mauser rifles, and the officers with Mauser pistols. One of the few photographs of expulsions by military force dates from April 1915. It shows a column of Armenian deportees from Harput, on the way to a prison camp near Mezireh, covered by Mauser rifles by Turkish troops. Observations by soldiers who took part in the atrocities are eloquent testimony to the use of German weapons in the genocide. Some come from the pen of the German major Count Wolffskehl from Urfa, a town with a large proportion of Armenian inhabitants. Things had been quiet there for quite a long time. "But then in early August 1915, two established butchers of Armenians came from Diyarbakir to Urfa, and took over the local command there. Count Wolffskehl had already taken part in the battle at the Musa Dagh, the "Mount Moses" not far from Antioch, about which the German author Franz Werfel wrote a moving documentary novel between 1929 and 1933. (11) Krupp cannons had been employed there, too. After the massacres in March 1915 in Zeitun, about 4,500 Armenians, fathers, mothers, and children, fled from the Armenian villages of the Musa Dagh in August up to the high plateau of the mountain, and took shelter there. "Tomorrow we will be on our way again, this time to Antioch [now Antakya], and from there to the coast. Things are rather hot there. A lot of Armenians who have only insufficient understanding of the government's friendly offer to relocate them elsewhere, and have lodged themselves with kith and kin, and unfortunately also with numerous rifles and ammunition, in the mountains somewhere between Antioch and the sea, with the expressed intent of not allowing themselves to be driven out....Now the difficulty of catching them is simply that one has to attack them from the sea-facing side. However, when Wolffskehl with his troops reached the Musa Dagh, the Armenians were no longer there. After 53 days of siege and attack by the Turks, they had been able to flee down the steep slope of the Musa Dagh to the shore. Lifeboats from the French and British warships took them on board, while the latter kept the Turkish troops on the slopes of the mountain in check with their naval guns. 4058 Armenians were able to escape in this way. So there can be no doubt about the complicity of the German government in the genocide. What is worthwhile is to try to find out who profited from the genocide, and how large their estimated profit was. But this is a difficult endeavor, because reliable documents are lacking, and many of the firms that profited have changed their owners in the century since the genocide. Still, let us make the attempt. According to this, the Ottoman Empire had imported rifles, ammunition, artillery, and gun-powder worth about 70 million reichsmarks by 1890: 46 million for Mauser rifles, 21.5 million for bullets, 2.3 million for artillery, and 0.7 million reichsmarks for powder. Converted to the value of the euro today, this would be, in a conservative estimate, orders amounting to more than 350 million euros. Further orders to the German arms industry followed after 1897, including large ones for warships. Mauser also landed a contract to supply 100,000 boxes of ammunition (one hundred million bullets) for the Mauser M/87 rifle worth about 83 million marks. The contract was signed that same year with the German ammunition factory Wilhelm Lorenz in Karlsruhe, which shortly afterwards was merged into the Vereinigte Köln-Rottweiler Pulverfabriken A.G. This, in turn, was interlocked with Deutsche Waffen- und Munitionsfabriken (DW & MF). Mauser and DW & MF formed a military-industrial complex for the production of small arms and ammunition whose killing potential was comparable to major weapon systems from companies such as Thyssen and Krupp. This armament-making group developed as follows: it began with the Berlin industrialist Ludwig Löwe, who started in 1869 by manufacturing sewing machines. For this purpose, he founded the firm of Ludwig Löwe & Co. Since the demand for his sewing machines was not as large as hoped, he switched to the side-arms and ammunition business, producing first artillery ammunition from 1874 on. Between 1877 and 1883 he expanded his business to arms and ammunition for the German and Russian governments. His firm flourished, and he bought up the ammunition maker Lorenz for six million marks, and then founded the firm Deutsche Waffen und Munitionsfabrik (DW & MF), based in Berlin. 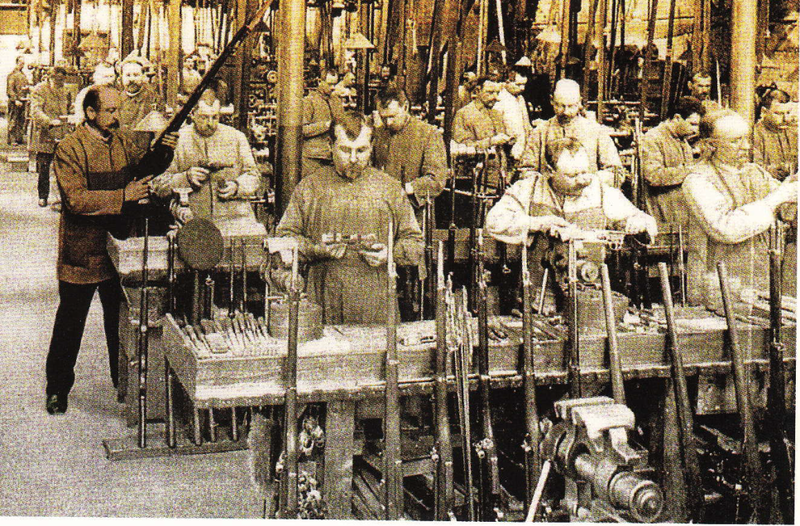 There followed the acquisition of arms and ammunition factories in other parts of Germany and Europe: the manufacturing plant for Maxim machine guns, the Mauser company – as mentioned – and finally holdings in an arms factory in Budapest and in the Fabrique Nationale d´Armes de Guerre in Herstal, Belgium. The Mauser branch of DW & MF profited -- undisturbed by annoying competitors -- from this monopoly position in its business with Turkey. After his brother Ludwig's death in 1886, Isidor Löwe succeeded him as the managing director of the company. It has not been discovered yet how high the net profit of DW & MF from the deals with Turkey were, nor how much the Mauser family gained over the years from its seven-percent share in the company. The artillery manufacturer Krupp could at first only dream of such a monopoly position. 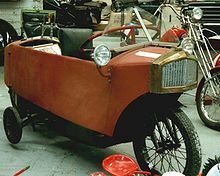 It engaged in dogged struggles with its main competitor, the Ehrhardt-Werke in Düsseldorf, over lucrative orders from the Ottoman government. In the end, Krupp always won; it had better connections to the German Emperor and his Imperial government. The two competitors did not hesitate to bring their haggling over the most favorable bid all the way to parliament. The Armenians who took cover from the cannon fire of the Turks on the Musa Dagh 15 years later presumably did not care whether the shrapnel that tore their comrades and family members apart had been purchased for 102 or 67 reichsmarks per shell. The Turkish Minister of War, on the other hand, was probably happy to be able to play off the competitors for his orders worth millions against one another, unless subordinates in the Ministry had already decided the competition beforehand for themselves, by accepting the biggest bribe offered. In current purchasing power, that amounts to 700 million to one billion euros. So the Krupp shareholders of that day will have pocketed large profits -- they were profiteers of genocide, as were the shareholders of DW & MF, which later renamed itself DWF (Deutsche Waffenfabriken AG). For the roughly 900,000 rifles delivered to Turkey by 1909, at unit prices of 70 to 80 marks, the total sales came to about 70 million reichsmarks. In addition, there was the revenue from many hundred of millions of cartridges, which presumably cost several times that amount. On 28 August 1910, Isidor Loewe died. We have no information about his heirs. Under the 1919 peace treaty concluded in Versailles, all German arms manufacturers were prohibited from producing weapons. In part, the companies switched to civilian products, for example Mauser switched to calculating machines, measuring instruments, sewing machines, and automobiles. The machines for arms production had been sent to Brno in Czechoslovakia, where the firm CZ continued the production of rifles in the period between the two world wars, and manufactured about 2.5 million Mauser rifles. CZ successfully supplied to the former Mauser customers in Latin America. Under the Hitler regime, which had broken the Treaty of Versailles in March 1935, and introduced general military conscription under the slogan "restoration of military sovereignty", the resurgence of arms production in Oberndorf began. The number of employees increased to 9,800. "With the seizure of power by National Socialism, the resurgence of our works after a period of decline and oppression began. We shall never forget the years in which an extorted treaty left our factories helpless before the brutal interventions of an inter-Allied military control commission, whose goal was to annihilate the Mauser Works. One of the signatories was the big industrialist Günther Quandt, who had taken command at Mauser, as at other arms manufacturers in Germany. So the genocide of Armenians was the blueprint for Hitler's war of conquest in the East. And Mauser was involved again. The company on the Neckar produced, besides long rifles and pistols, millions of model 98-k carbines, the standard-issue weapon of the German Wehrmacht, with which millions of people were killed or wounded on all fronts in Europe, North Africa, and Asia Minor. Much the same applies to Krupp with its cannons and armor-plating. Among historians, three Turkish generals in particular are held to be responsible for the planning and performance of the genocide of 1915 to 1917, that cost about 1.2 million Armenians their lives: Enver Paşa, the Minister of War, Jemal Paşa, the commander-in-chief of the Fourth Army and governor-general of Syria, and Talât Paşa, the Minister of the Interior and commander-in-chief of the Turkish gendarmery, which accompanied and guarded the death marches of the Armenians into the emptiness of the Syrian desert, and participated in massacres on the way. After the Armistice of Mudros, which ended the First World War for the Ottoman Empire, they fled to their old comrades-in-arms in Berlin, in order to avoid being put on trial by the Entente powers. All three suffered in one way or another for being principal perpetrators of the genocide: Enver, who felt his dream of a greater Turkish empire including the Turkic peoples in [TS1] Central Asia to be closer than ever after the expulsion and extermination of the Armenians, was shot off his horse in a cavalry attack against Soviet troops near Dushanbe, the present capital of Tajikistan. Talât Paşa was assassinated on 15 March 1921 in the Hardenbergstraße in Berlin by the Armenian secret society Nemesis – as was Jemal Paşa, who had followed Enver from Berlin to Central Asia, where he wanted to continue the war against Britain. On 21 July 1921, two Nemesis assassins shot him dead in the capital of Georgia, Tbilisi. Nor did any of their German accessories in the Turkish general staff and the German arms factories in Oberndorf, Berlin and Essen ever face trial– neither Field Marshal von der Goltz, nor the chief of the general staff, Fritz Bronsart von Schellendorf, the naval attaché Hans Humann, or the chief-of-staff of the Third Army, Felix Guse, who had termed the annihilation of the Armenians "severe, but useful", and had themselves drawn up the fatal deportation plans in part. Field Marshal von der Goltz died on 19 April 1916 of a typhus infection in his headquarters in Baghdad. Many other generals from the German military mission in Constantinople or from the staffs of the various Turkish armies continued their military careers after the genocide. Paul von Mauser had died shortly before the start of the First World War, with numerous honors and a member of parliament in the German Reichstagsat the end of his life. His superior at the head of Deutsche Waffenfabriken DWF, Isidor Loewe, died before him in 1910. There was never a word of regret from the two arms companies mainly involved, Mauser and Krupp – neither after the Second World War from the legal successor to the Mauser Works, the Nuremberg arms firm Diehl, nor from the firm Rheinmetall, which took over Mauser in the year 2004, and renamed it Rheinmetall Defence - Weapons and Ammunition. The Mauser company logo disappeared after 132 years. In the official company history of the Mauser Works, which can be read on the Rheinmetall Web site,(26) there is not a word about the genocide, and the possibility of reparations – even though merely symbolic – to hundreds of thousands of Armenian families is not considered, any more than to the thousands of forced laborers from abroad who had to slave in German arms production under inhumane conditions during the Second World War. "We need to be able to forget those days for once," the managing director of the Mauser Works said in 1983 in an interview for the documentary film Fern vom Krieg(27) in reply to a question about compensation for the victims of the forced labor. A general amnesty granted to oneself by general amnesia, so to speak. The thousands murdered with Mauser weapons the Mauser managing director already did not find worth mentioning even then. Almost exactly a hundred years after the start of the genocide in Armenia, on 26 March 2015, a military alliance led by Saudi Arabia, consisting of, besides the Saudis, Egypt, Bahrain, Qatar, Kuwait, the United Arab Emirates, Jordan, Morocco, Sudan, and later Senegal, began a military intervention in Yemen under the name Operation Decisive Storm. There, Islamist rebel groups such as the Houthi militia supported by Iran had driven abroad the President, Abd-Rabbu Mansour Hadi, and conquered the capital Sana'a. Southern Yemeni separatists, as well as fighters of the Islamic State (Daesh) and Al-Qaeda also became involved in the fighting. Since then, a civil war has raged, in which, according to the UN Human Rights Council, has cost the lives of more than 5,000 civilians, including 1200 children. Even worse: seven million people are threatened by famine, and 14.5 million have no access to clean drinking water. A cholera epidemic has broken out. More than 600,000 cases were reported as of April 2017, and two to four thousand people have died of it. Saudi Arabia has imposed a naval blockade on Yemen, including by means of recently-delivered German patrol boats. Since then, food and medicine cannot get into the country, or only indirectly. Yemen's infrastructure has been largely destroyed; Saudi-Arabian Tornado and Eurofighter jets attack positions of the Houthi rebels and Islamists almost daily, killing many civilians in the process. Yemen is being besieged and starved out, say international aid organizations. The military coalition has bombed out the most important port, and has prevented aircraft landing at the Sana'a airport for the last year-and-a-half. "A medieval siege tactic is being implemented with the latest weaponry, and an entire people starved into submission. More than the combatants, who take what they need by force of arms, it is the populace that suffers from the blockade," commented the Süddeutsche Zeitung. (28) More than 80 percent of Yemenis depend on food and medicine aid, it reported. But because these cannot be supplied, seven million people on the southern tip of the Arabian Peninsula are going hungry. 1. Once again, the world public is looking away. The Yemenis are nobody's ally, and have hardly any natural resources, such as oil, worth mentioning. The poorhouse of the Arab world is being ignored just as were the Armenians, who did not have any allies, either. The Saudis and the United Arab Emirates, on the other hand, are of the greatest strategic value to the West – as was the Ottoman Empire in 1913 for the Germans and Austrians in the run-up to the First World War. All German governments since Helmut Kohl's coalition of Christian Democrats and Gerhard Schröder's coalition of Social Democrats and Greens have played a major role in arming Saudi Arabia – after the USA and Britain, Germany was, and under Chancelloress Merkel continues to be, the third-largest arms supplier to the Saudi kingdom. So instead of Mauser, now Heckler & Koch, instead of Krupp now Krauss-Maffei-Wegmann. It does not bear thinking of what would happen if an open war between the two hegemonic powers Saudi Arabia and Iran broke out. Then German weapons would be involved on both sides again, as in the first Gulf War, between Iraq and Iran, in 1980-88, in which more than a million soldiers and civilians lost their lives. At the time of the First World War, the Ottoman Empire was heavily armed: almost a million long rifles, carbines, machine guns, and pistols from Mauser of Oberndorf, as well as thousands of field-pieces from Krupp in Essen formed the backbone of their armament. Most of the regular Turkish soldiers and gendarmes were armed with Mauser rifles, and the officers with Mauser pistols. During the production run, several modifications were made to the model M/87 rifle: first the M/89 and finally the M/90, a repeating rifle with a mid-stock magazine for 7.65 mm caliber nitro-powder cartridges. Of this model, short-barreled carbine versions were produced specially for the cavalry. Between 1885 and 1912, Krupp supplied hundreds of field-pieces of the models L 20, 24, 27, and L 30 and 50, with calibers of 7.5 and 8.7 cm; model L 35 and KL 35 coast-artillery guns with calibers of 25 and 35 cm, and model L 6.3 and L 6.4 mortars with calibers from 12 to 21 cm to the Ottoman Empire. In addition, they supplied armor plating for naval vessels. Krupp weapons were supplied not only to Germany's, but throughout the world, including to the Ottoman Empire and South America. Warships, such as the Goeben and Breslau, armor-clad with Krupp steel, in particular were of central importance for the Ottoman Empire. The Goeben catapulted Turkey at Germany's side into the First World War. It made the Black Sea practically into German inland waters, and blocked the Russians' access to the Mediterranean. It indirectly provoked the Allied landing at Gallipoli (Dardanelles), where 252,000 British and French troops and their allies were killed or wounded. And all this happened although the British and French dominated the Mediterranean at the start of the war. In the summer of 1914, the Goeben (1,013-man crew) and the protected cruiser Breslau (373-man crew) were the only two warships that embodied the Emperor's dream of German sea-power in the Mediterranean. "(2) In 1910, Berlin sold the later Torgud Reis -- formerly the HMS Weißenburg -- an armored vessel of the Imperial Navy clad with Krupp steel, to the Ottoman Empire. The steel 28-cm guns of the Navy ships of this class were also products of the Krupp firm, as were the guns of the fortresses of the Dardanelles at the strait of the Bosporus. The guns were almost all made in Germany, and until the middle of 1914, they could still be shipped by sea from Germany. The installation of the heavy cannons under the direction of German specialists required much effort. Some fortresses were actually built around the guns. Colonel Colmar Baron von der Goltz was assigned by Emperor Wilhelm, among other things, to offer the Ottoman Empire Krupp cannons. "Alfred Krupp himself regarded German diplomats in Turkey as his salesmen." Von der Goltz had already previously arranged the supply of large quantities of Mauser rifles with the Sultan. Thus he succeeded in creating, besides the rifle monopoly, a second monopoly on artillery in the Ottoman Empire -- at the expense of the French and British arms makers who had previously dominated this market segment. Gustav Georg Friedrich Maria Krupp von Bohlen und Halbach, who first as a member of the supervisory board [Aufsichtsrat], and then as its chairman, of the industrial firm of Krupp played a decisive role in the orientation of many business deals, including with the Ottoman Empire, must be considered the main party responsible. He had become acquainted with Bertha, the eldest daughter and sole heiress of the business, when serving as a secretary of the Prussian embassy to the Vatican. After their marriage, it was important to Emperor Wilhelm II that the name Krupp should not disappear from the succession of the firm. In a royal Prussian decree, he announced that she was to be called Bertha "Krupp von Bohlen", and he Gustav "Krupp von Bohlen und Halbach". In accordance with Friedrich Alfred Krupp's last will, in 1903, the year after his death, the company was converted into a public limited company, of which 99.9% of the shares were to go to Bertha. Its opening capital was about 40 million dollars. By the beginning of the First World War, this amount had almost doubled. After their marriage, Gustav Krupp von Bohlen und Halbach was made a member of the supervisory board of Friedrich Krupp AG in 1906, and chairman of the supervisory board in 1909. The Krupps' career showed the close links between the complex state apparatus of the Empire and industry, the Krupp family in particular. In 1910, Gustav Krupp von Bohlen und Halbach was made a member of the Kaiser Wilhelm Society [the predecessor of the Max Planck Society]. After the German Empire had initiated the First World War with its declarations of war on Russia and France, the company, under the direction of Gustav Krupp von Bohlen und Halbach, concentrated its production largely on armaments. That the Krupp firm must have known about the deportations and killings of the Armenian minority in the Ottoman Empire is suggested by contemporary sources: "The German military was also involved in the logistics of the deportations, as shown by a deportation order signed by Lieutenant-Colonel Böttrich, the head of transportation (Railway Department) in the Turkish Grand Headquarters in October 1915, which affected Armenian workers on the Baghdad Line. The Baghdad Line itself and the Anatolian Railway also served to transport captured Armenians before this. "(6) The Krupp company participated directly in the building of the Baghdad Line. That Krupp also played an important role in the arming of Latin American countries in the late nineteenth and early twentieth centuries was demonstrated by the historian Jürgen Schäfer. (7) In Bolivia, Argentina, and Chile, German army instructors had already begun to re-organize and modernize the armed forces before 1890. German weapons, mainly Mauser rifles and Krupp cannons, which had won comparison firing trials against European competitors, played an important role in this modernization, and helped to reinforce the Prussian-German influence among the military leaders of these countries, and establish a rifle and cannon monopoly there. Even after the merger with the steel-making group Thyssen to form Thyssenkrupp AG, Krupp remained one of the most important arms manufacturers and exporters of Germany and Europe. Today, Thyssenkrupp presents itself on its company Web site as a diversified industrial group focused on steel working, with more than 158,000 employees at 500 locations in 79 countries throughout the world. Its product range officially includes – besides naval shipbuilding – construction, buildings, infra¬structure, mining, metals, chemistry, energy, household appliances, food and drink, aviation, machinery making and plant construction, oil and gas, and special-purpose vehicles. he is a renowned German documentary filmmaker, commissioning editor and essayist. Between 1978 and 1993, he worked as a reporter and producer for political TV news programs of major public channels such WDR and NDR. Apart from that, he produced more than 30 long documentaries on political, social and environmental issues and commissioned over a hundred more. For his films and his editorial work he won 16 awards at national and international film and TV festivals. He has produced several films about the German armaments industry, such as Far from War (1984), Panteón Militar (1991) and Living from Killing (2016) Before he retired in 2012, he was head of the department of cultural, historical and scientific documentaries at WDR. Since then he has been working as a free-lance filmmaker and lecturer for film schools and universities. (born 1956) is a free-lance journalist and head of the Berliner Informations¬zentrum für Transatlantische Sicherheit. Contributions to television news programs (Monitor, Panorama, Frontal 21 int. al. ), radio (Streitkräfte und Strategien, SWR2, WDR5, int. al.) and print media (Spiegel, Tagesspiegel, TAZ, Frankfurter Rundschau, Loyal, Wissenschaft & Frieden, Friedensforum int. al. ), electronic media (Spiegel online, The European, Blättchen int. al.). Most publications can be seen on line. is a peace activist, one of the spokespersons of the Essener Friedensforum, in the Peace Education working group of the GEW NRW (State teacher's union), representative of the VVN-BdA NRW in the Bundesausschuss Friedensratschlag, and author of texts on peace policies and peace education. He also has a public artistic presence, such as with the exhibition "Wars Do Not End in Peace", and initiates and promotes peace actions on the occasion of conferences of NATO military and nuclear strategists in Essen. Trautvetter is a critic of the development of the arms industry in the Essen region, which once gained dubious fame as the "armory of the Reich" during the World Wars. He was awarded the Düsseldorf Peace Prize in 2018. (born 1963) is a physician specializing in general practice in Villingen-Schwenningen. After working as a teacher in Cameroon for two years, he studied medicine, and trained as a specialist in Manchester, England and in Villingen-Schwenningen. Since his university days, he has been active in the International Physicians for the Prevention of Nuclear War (IPPNW). He is International Councilor of the German section and an elected member of the international executive committee of the IPPNW. In 2013, he organized the Zielscheibe Mensch congress on small arms in Villingen, in which 300 physicians, scientists, and activists from all over the world took part.